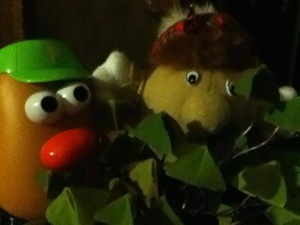 Here is a picture of me and my pal Haggis. These are my lucky shamrocks. Too bad we didn’t find our pot of gold today. Maybe next year. This entry was tagged 365, blogging, fun, kid friendly, laughing, Mr. Potato Head, st Patrick's day. Bookmark the permalink.